Chobani this morning released the brand anthem TV spot/video for its new umbrella campaign, “Believe in Food,” which will run through 2017 and beyond. 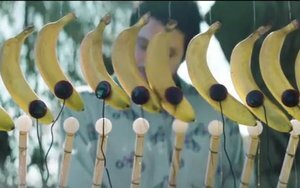 Called “Fruit Symphony,” the 30-second ad (below) features a group of performers — six of whom are actual Chobani employees — in a verdant setting, playing instruments made of fruit and singing Burt Bacharach’s '60’s classic, “What the World Needs Now.” The ad was directed by movie and music video director and screenwriter Michel Gondry. The commercial marks the first brand work for Chobani by Wieden+Kennedy, which was named its creative agency of record last September. That marked the end of a two-year period in which Chobani had eschewed the traditional AOR model in favor of in-house-led creative. Product-focused ads employing the new “Believe in Food” tagline actually began appearing in February, with a 30-second spot introducing the Drink Chobani yogurt smoothies line and a 15-second one dedicated to the mixed berry variety. The tagline has also appeared this year in 15-second ads for the key lime and almond coconut varieties of Flip, Chobani’s spoonable yogurt-with-mixables snack line. Chobani says that “Believe in Food” integrates its foundational brand “manifesto,” which declares that good food can be a source for good in the world and “bring people together.” It’s also meant to convey that consumers can believe in Chobani’s natural ingredients and innovation, in the dedication of the employees behind its products, and in the company’s “people and community first” philosophy. Chobani’s progressive policies — including paid parental leave and donating a portion of its profits to food-related charities — drew more press last April, when the company gave its roughly 2,000 employees shares that will be worth up to 10% of its value when it goes public or is sold. It’s also been in the news, and been the subject of anti-Muslim sentiment and fake news reports, for its hiring of refugees, including Muslim immigrants resettled by the U.S. government. Indeed, Chobani being no slouch at leveraging earned media, the new ad’s release follows a “60 Minutes” interview with Chobani founder Hamdi Ulukaya, which aired last night. Ulukaya, a Turkish immigrant, continued his advocacy for refugees, who represent about 30% of Chobani’s workforce, stressing that their hard work and loyalty have been instrumental in building the company. The employees who were chosen for the new ad (via an internal, open casting call) highlight Chobani’s commitment to diversity: They hail from countries including India and Thailand, as well as various states in the U.S. Their stories are also being featured in a dedicated area of Chobani’s site, which has been updated for the campaign, and quotes from them will be featured in other online efforts. “There’s a lot of goodness that goes into every cup, and we wanted to tell the story of the people who make our delicious, nutritious products,” summed up Chobani chief marketing and brand officer Peter McGuinness. The Fruit Symphony ad is airing on national cable networks and is currently posted on Twitter, as well as YouTube. The campaign includes paid social media, as well as online. Media partners include Time Inc. and Thrillist. Other campaign elements span PR; point-of-sale/shopper marketing promotions in more than 5,000 retail locations; appearances at some 50 community events around its Upstate New York and Twin Falls, Idaho manufacturing plants; and a cross-country tour by its “ChoMobile.” Chobani signed Horizon Media as its media agency of record last August. As the major Greek yogurt pioneer in the U.S., Chobani grew in leaps and bounds from its founding in 2005. That was interrupted for a time starting in 2014, due to a combination of an outbreak of mold contamination; tardy but aggressive pushes into the Greek category by Dannon and General Mills’ Yoplait; and an inevitable slowdown in the double-digit sales increases seen for several years in the Greek spoonable sector. But Chobani quickly recovered, thanks to an ongoing string of new products that have included the breakthrough Flip, stevia- and monk fruit- sweetened Simply 100, Mezé Dips, and lines for kids and tots, as well as the new smoothies. Chobani has also continued to release new flavors across its lines and has launched initiatives like a healthy foods incubator and Chobani Cafés in New York’s SoHo and TriBeCa sections and Tomball, Texas. Strategic marketing — including both mainstream advertising and “grassroots,” event- and influencer-based efforts — have of course done much to drive the renewed growth. The most visible initiative to date was 2016’s controversial, competition-bashing ads for Simply 100, which generated massive press coverage and social buzz before they were ultimately restrained by a court after Dannon and General Mills sued. By then, the ads had already completed their TV schedule. Last year, overall U.S. yogurt sales declined 0.3%, but Chobani had double-digit growth, with sales totaling $2 billion (about double its 2013 sales), per Nielsen data cited by Dairy Reporter. That gave Chobani — which makes only Greek varieties — 20% of the total Greek and non-Greek spoonable U.S. yogurt category, surpassing Yoplait’s 19% share (down from 25% in 2011) and $1.75 billion in sales. Dannon, with its non-Greek dominance plus its Greek lines, still leads the overall category, with a 34% share last year. But in the Greek segment, Chobani holds a nearly 37.6% share, according to the company.